Diversion of waste away from landfill sites is a current preoccupation of the UK government, and in many other countries landfilling is also being reduced. This is why recycling is so important, and why we have included this article in our articles here at ”the Landfill Site”. Recycling Metal: Millions of tonnes of Metal are recycled each year in the UK alone, generating billions of pounds in revenue. Just over half of the recycled metal is exported to meet foreign demand and the rest is reprocessed within the UK to make more metal. Metal is an extremely useful and versatile material that is used to make many items in every day use including cars, trucks, ships, aeroplanes, household appliances, railway tracks, cutlery, ovens and of course it is also used for packaging. One major advantage in recycling metal is that it can be recycled over and over again without losing any of the properties of the metal itself. Metal is therefore a valuable commodity and as such, when a metal item reaches the end of its life, it can be used 100% of the time to make new metal. The most common metals in every day household use today are Steel and Aluminum – Steel is used to make food cans and Aluminum is used to make soft drink cans. You can tell the difference between Steel and Aluminum using a magnet because Steel will stick to a magnetic whereas Aluminum will not. 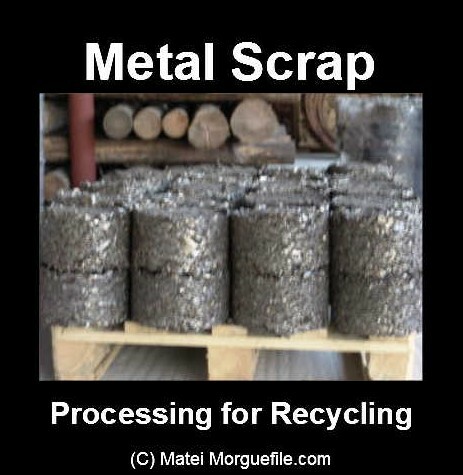 This makes the sorting of various types of metal at recycling depots a lot easier as opposed to say plastic recycling where sorting is a much more complex practice. When recycling metal, it is divided into Ferrous and non-Ferrous metals. Ferrous scrap metal is metal from Steel and Iron so this includes food cans, scrap metal from cars and household appliances etc. According to the British Metal Recycling Association (BMRA), over four and half million tonnes of Iron and Steel scrap metal was supplied to Steelworks in the UK in 2005 to make new Steel and over 6 million tones were exported. Ferrous scrap metal is in demand and growth has increased by approximately 5% each year for the past decade. Nonferrous scrap metal is waste from metals such as Aluminum, (so includes drinks cans, foil milk bottle tops, foil wrappers, baking trays, kitchen foil etc.) and also Copper, and other metals such as Nickel, Brass, Titanium, Lead and Chromium etc. Less non ferrous metal waste is available but it is more profitable than Ferrous Metal. According to BMRA, in 2005, over a million tonnes of non ferrous metal was processed and nearly half of this was Aluminum followed by Copper and then the other metals. Over 800,000 tonnes was exported representing an increase of 20% on 2004 figures. The most common household waste metal items generated are food and drinks cans. Recycling these cans is quite a simple process. After the cans are collected they are separated into Steel and Aluminum cans. Steel cans are melted down and the impurities (slag) are removed and will often be recycled back into the construction industry. The remaining pure metal is made into ingots or blocks of steel, which can then be used to make more cans and other products. Aluminum cans are compressed and melted down, impurities are removed and again, the Aluminum is made into ingots which can then be rolled into Aluminum sheets before being turned into new cans or other products. This whole process is quite rapid and an Aluminum can is often back on a supermarket shelf in as little as 6 weeks. Most local authorities now provide a means to dispose of empty cans either by roadside collection or at a recycling depot so make use of these facilities and encourage others to do the same as in this way you can help protect the environment and save energy. Reduces the need to mine the raw materials required to make the metal such as Iron ore for Steel, Nickel for Stainless Steel and Alumina and Bauxite for Aluminum. Recycling metal is big business and although household waste makes up a small percentage of the total amount of metal recycled, it still makes an important contribution so it is important to recycle those cans as any metal ending up in landfill is simply a waste of valuable resources. Recycling metal can also be an excellent way to make some additional cash from things that you thought were just scrap, by spending some time your home de-cluttering it. Perhaps you have old appliances, toys, or plumbing components saved away in your garage. Or an old bike that not works, and old fence posts from a couple of years ago when you replaced your metal fence with a new one. Not all items will be valuable to a business, but in cases where a business is not paying you for scrap metal, they will still typically drop in to pick it up, free of charge, so it’s still a wonderful way to clean up your residence or business.